Tatyana and Sergey Nikitin, one of Russia’s most famous singer-songwriter duos, will perform on February 11 at the Southbank Centre in London as part of the Year of Russia in Britain programme. The headline of the concert is “To the Music of Vivaldi”, which is also the name of the husband-and-wife singing duo’s most popular song. All profits from the show will go directly towards charitable projects of the Maria's Children Foundation. The event will be held in memory of the late Ilya Segalovich, founder of the Russian Internet giant Yandex who was also one of the guardians of the Pelican Center, a division of Maria’s Children. The poetic song genre emerged in the Soviet Union in the early 1950s. The genre itself is not a Russian creation. Poet-songwriters who performed their own songs with a guitar became a common feature of the music scene in many countries around the world at the time. These singers were known as Liedermacher in East and West Germany; cantautor in Italy and Latin America, auteur-compositeur-interprète in France, and singer-songwriters in the United States. In Russia, they are often referred to as “bards”. The first Soviet bards were students; interestingly, most of them were young biologists, physicists and historians rather than language or literature students. At first, their lyrics were mostly romantic stuff and they sang about the beauty and romanticism of life; these attributes were much craved by young Soviet men and women since they were generally hard to find in the drab and dreary climate of that time. The singer-songwriter who captured the mood of that generation better than most is Bulat Okudzhava. His songs - and he has about 200 to his name - first became popular among the Soviet intelligentsia, who passed on the singer's bootleg tape records from hand to hand. After a while, the Russian-speaking community abroad also discovered Okudzhava. His first LP record was released in Paris in 1968; in the Soviet Union, however, the first Okudzhava LP came out only in the mid-1970s. The bard genre quickly became the favorite music of Soviet students and enthusiasts of backwoods camping trips. It also became part of the day-to-day lives of the Soviet intelligentsia, and staple entertainment during picnics. It soon became so popular that singer-songwriter clubs sprang up in many Soviet cities. In fact, the KGB had a hand in that; the government wanted to keep a close eye on the prevailing mood and sentiment among students. The KGB's worries were entirely justified; criticism of the regime became an important part of the singer-songwriting scene in the 1960s. A case in point is Aleksandr Ginzburg, who performed under the stage name Aleksandr Galich. He began in the 1950s as a talented and popular Soviet playwright, but soon started to write and perform songs that were increasingly critical of the Soviet government. The government responded by banning his public concerts; publishers were told not to print his lyrics, and the government-controlled record company refused to release his LPs. From a respected Soviet playwright Galich soon turned into a dissident. In 1974 he was stripped of his Soviet citizenship when he was in Norway for a human rights workshop. Several years later he died in exile. The ban on his songs remained in place for many years after his death. Another bard and human rights activist, Yuliy Kim, was forced to use a pseudonym to hide his real identity until 1985. In the KGB dossiers he was known as the Guitarist. His songs openly satirised Soviet life and some of them dealt in a very outspoken manner with the subject of Soviet dissidents, trials, and police crackdowns. Vladimir Vysotsky is often named among the bards, too – but he did not consider himself to be a bard. Many of his songs contained sharply humorous social and political commentary, which led Soviet authorities largely to ignore him as a musician for years, though he enjoyed a mass public following as people copied cassette tapes of his work. He was also a successful actor in theatre and film. Vysotsky died in 1980, aged just 42. His enduring fame continues to this day, however, with many modern musicians and actors citing Vysotsky's work as a vital influence. 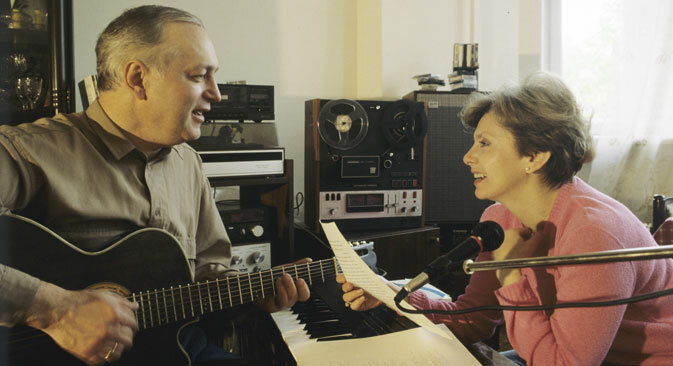 Tatiana and Sergei Nikitin, who will soon perform in London, are among the most famous Russian bards. Paul Mauriat, the famous French orchestra leader, was so impressed by their song “To Vivaldi Music” (co-authored with Viktor Berkovskiy) that he even recorded an instrumental version of it. Finally, the famous film “Moscow Does Not Believe in Tears" - one of the very few Russian films to have won an Oscar - features several songs by Sergei Nikitin in the soundtrack.